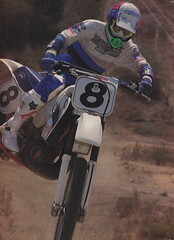 Here is another in my series on motocross bike history. This installment covers Kawasaki’s mini class racers from the first KX80 in 1979 through the current KX85 and KX100 models. While slightly late to the mini party, Kawasaki quickly asserted itself as a mini-class power in the early 1980s. Their KX80 and KX60 mini racers have powered countless riders to amateur national titles and the roster of riders that started on Team Green reads like a who’s who of professional motocross. They were the first manufacture to add features like a disc brake (front in 1984, and rear in 1988) to their minis and the first brand to embrace the move toward larger “big wheeled” versions of their 80s. Today, they continue to innovate and support the mini class with new models that can go toe-to-toe with the best from Austria and Japan. For this post, I have once again placed all the models in chronological order and labeled them by model and year. I have tried to be as thorough as possible, but sometimes it can get a bit confusing in the mini class. Because manufactures often end up with leftover mini inventory, they tend to skip a year here and there to help dealers move it all out. Still, I think this is pretty complete and comprehensive. Once again, I have included the YouTube presentation I produced a few years ago as well if you prefer your minis to roll on by without your assistance. This one was done back in 2015, so a few of the latest models are not included. I hope everyone enjoys this look at Kawasaki mini history.